Run for the Fallen is today remembering – and honouring – Sgt. John David Rode, 1st Battalion, 12th Cavalry Regiment, 3rd Brigade, 1st Cavalry Division. A hero among heroes. As with all our heroes, John is not only a hero to all of us; he is also the precious son of Cheryl and Tom Rode; beloved nephew to Cat and Eddie Brooks, and most gentle, awesome uncle to the children. John’s family graciously shared their stories, their pictures of John, and it is my honour and priviledge to be allowed to share with you, through those who love John the most. Valentine’s Day is the time of year to let a spouse or significant other know how special they are. For our family, Valentine’s Day 2007 will forever be the day we lost our beloved Sergeant John D. Rode to an IED in Baquba, Iraq. John, a Canadian citizen, was on a recovery mission when he paid the ultimate sacrifice for his adopted country at the young age of twenty-four. 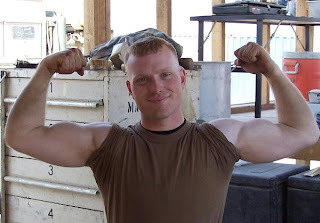 Hailed by his fellow soldiers as a leader and mentor, John could often be found in the gym encouraging his comrades to maintain peak levels of fitness or counseling a young soldier. He was “Uncle John” to Ronnie G. Madore’s two children, who was driving the vehicle during the attack and also lost his life. John was tough and kept himself in peak physical condition with muscles like rocks. He was the prototypical gung-ho soldier. But he had a compassionate side, knew how to have fun, and enjoyed playing with little kids. One could say that John was a big kid himself off duty, and then changed into a serious, uncompromising professional on the job. Sergeant Rode was awarded the Purple Heart and the Bronze star. He was awarded US citizenship posthumously the day before his interment at Arlington National Cemetery by the head of the INS and the head of Homeland Security. Our family will never forget the unselfish acts of kindness John committed as a soldier and as a civilian, and we will always be proud of him for his love of country and commitment to keeping us safe. Godspeed, John. I am so sorry it has taken so long for me to get back to you…the real reason is every time I sit down to write I have so many memories flooding back and I don’t know where to begin…. As I said, my memories are too numerous to be condensed into a few paragraphs, but I will share two of them with you. Both are wonderful examples of how he lived his life culminating in the ultimate sacrifice he made for those he loved. After coming back from his first tour of duty in Iraq, I noticed a big change in John. He had grown up so much becoming so much more focused. Through his serious and tough exterior that he had adopted, he let us see the big kid he was still inside. He absolutely loved my kids with abandon and was not afraid to show it, often rolling on the floor and chasing them on the playground. His gentleness and awe of the little vulnerable baby that was presented to him when he met his little niece Izzy for the first time was precious. To see this big strong tough Soldier hold that baby with such tenderness and love was a glimpse into his soul. I asked him one day about one of the most recent suicide bombings that occurred in Iraq that had killed a number of innocent children. He told me that he was a part of the mission that was responsible for cleaning up the carnage. He looked at me and told me he felt like he was picking up pieces of his little nieces and nephews and how horrible it was. As I looked into his eyes I felt the intense pain he was subjected to. He was able to work through that pain and allowed it to create a depth to his soul that enabled him to love even deeper. Okay, the tears have started again… That part always gets me. I am so proud of John,… For some reason I have no trouble speaking about him, it is always when I get introspective and have to compose my words that I get emotional…. Let us never forget. Thank YOU for your service, John. My thanks to ALL the Rode and Brooks family for your sacrifice. I will always honour John. Love never dies. Rest easy John, rest easy.